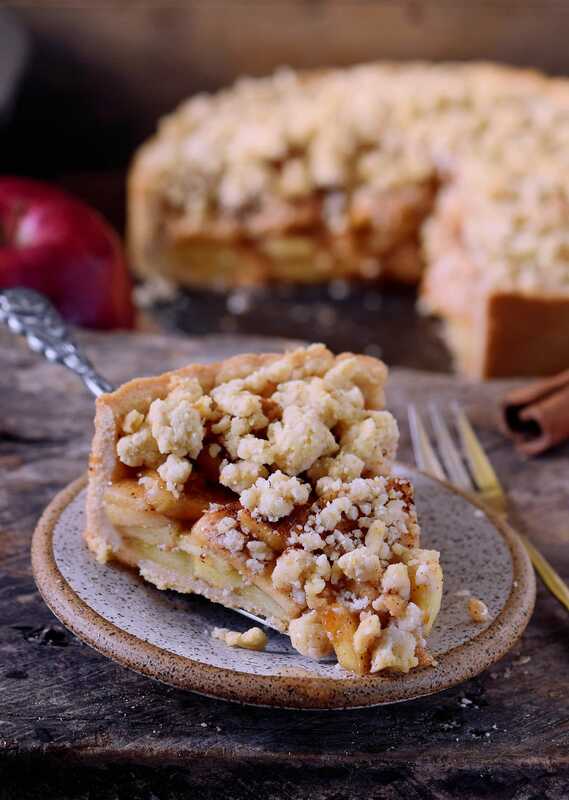 Fall is on the doorstep and what could be better than enjoying a delicious vegan apple pie? 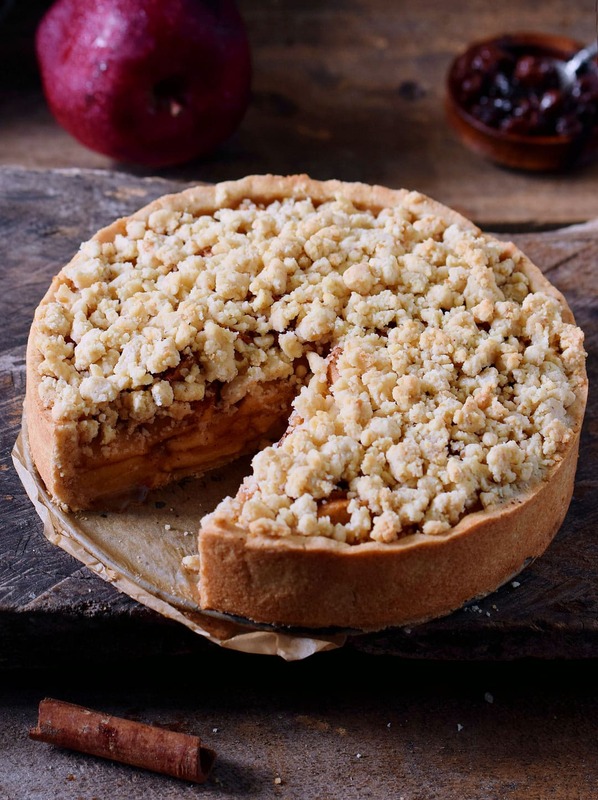 The buttery streusel (crumble) on top makes this fall dessert really special and tasty. 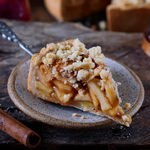 This apple streusel pie is vegan, gluten-free, refined sugar-free can be made nut-free, and even grain-free. It’s incredibly delicious and will make your kitchen smell like heaven on earth. I am not kidding! I wish my kitchen could have this apple cinnamon scent all day, every day, haha. So maybe I should bake this vegan apple pie every single day. For the pastry, I used a gluten-free flour mixture, margarine, flax egg, and coconut sugar. I actually “mixed” the dough with my hands because I was too lazy to use the food processor and clean it afterward (story of the day lol). But you can, of course, use a food processor, I am sure it works equally fine. The filling consists of delicious sweet apples, cinnamon, coconut sugar, lemon juice or lime juice and a little bit of tapioca starch. You can also add raisins, rum extract, and vanilla extract if you like. Enjoy this vegan apple pie with dairy-free vanilla ice cream on top because the combination hot/cold is simply unbeatable. 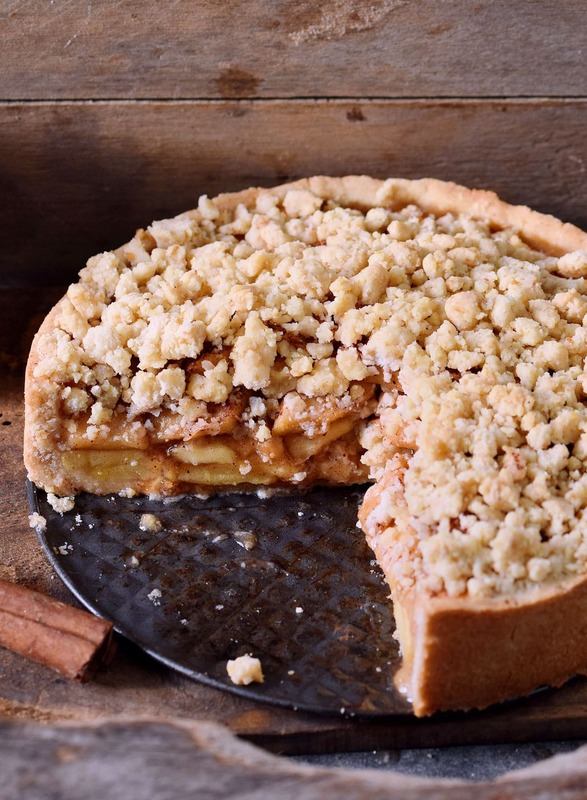 The pie is not covered with a second pie crust, just with streusel. 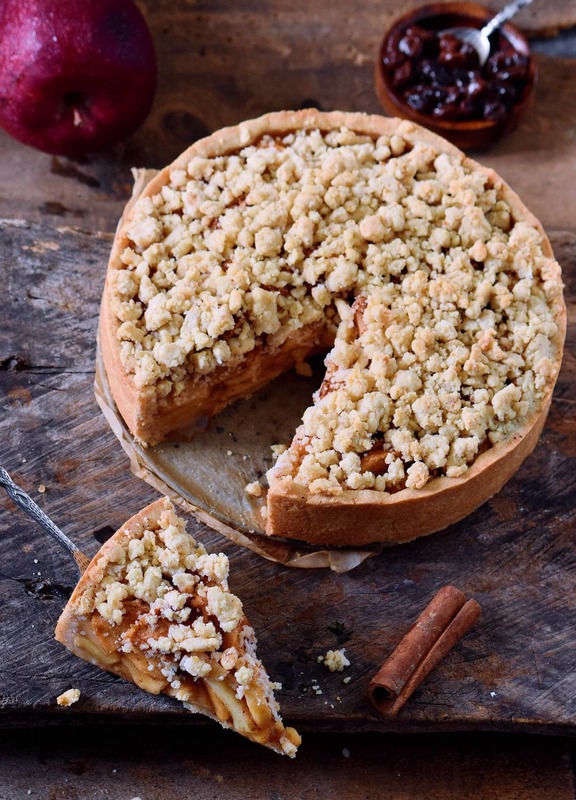 You will just need to crumble the streusel on top and don’t have to deal with rolling out a second pie crust and placing it on top of the apple filling. I mean, you actually can do it, however, I really love easy recipes and adding the streusel on top is so much easier, trust me! Should you recreate my recipe, please leave a comment below and don’t forget to tag me in your Instagram or Facebook post with @elavegan and #elavegan because I love to see your recreations. If you are looking for more fall desserts, then definitely also try out my vegan pumpkin cake. 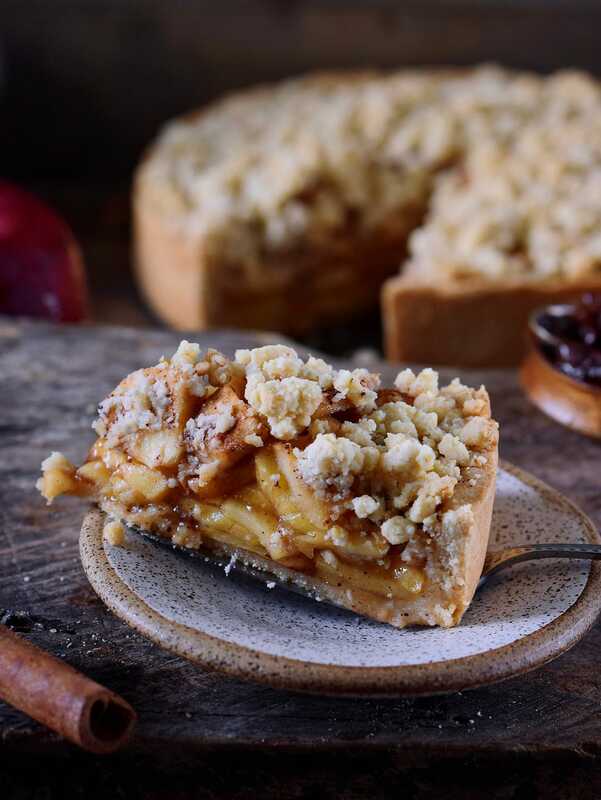 This vegan apple pie with streusel is the perfect fall dessert. It will make your kitchen smell like heaven and sweeten up your day. The recipe is vegan, gluten-free, can be made nut-free and refined sugar-free. To make the flax eggs, put 2 tbsp ground flax seeds to a bowl, add 5 tbsp water and mix with a whisk. Set aside for 5 minutes. Now put all ingredients for the Pastry & Streusel to a food processor and blend until the dough clumps together. If you don't have a food processor, simply add all ingredients for the pastry to a bowl and use your hands to knead the dough until it clumps together. If the dough appears too dry add a tiny bit of cold water. Roll the dough into a ball, wrap it in clingfilm and place it into the fridge. Refrigerate for about 30 minutes. Meanwhile, peel and core the apples and chop into slices (approximately 0.2 inches / 0.5 cm thick). Add the apples and all other "Filling ingredients" to a large pot and stir to combine over medium heat. Let simmer for about 2 minutes and turn off the heat. Taste it. If you think it's not sweet enough add more sugar to taste. Preheat the oven to 360 degrees F (180 degrees C) and brush an 8-inch pie pan (or a springform) with either coconut oil or margarine (vegan butter). Set aside. Remove the dough from the fridge. Save about one third for the Streusel and roll out the remaining dough to fit the bottom of the pan. Press it into the pan and about 2 inches (5 cm) up the sides. 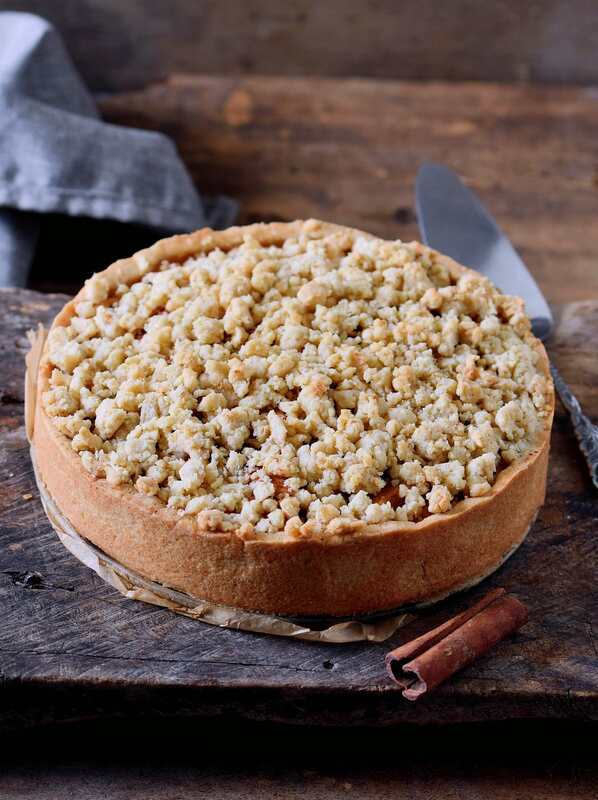 Add the filling and crumble the streusel on top. Bake for 45-50 minutes or until golden brown. Let cool until you cut into it. 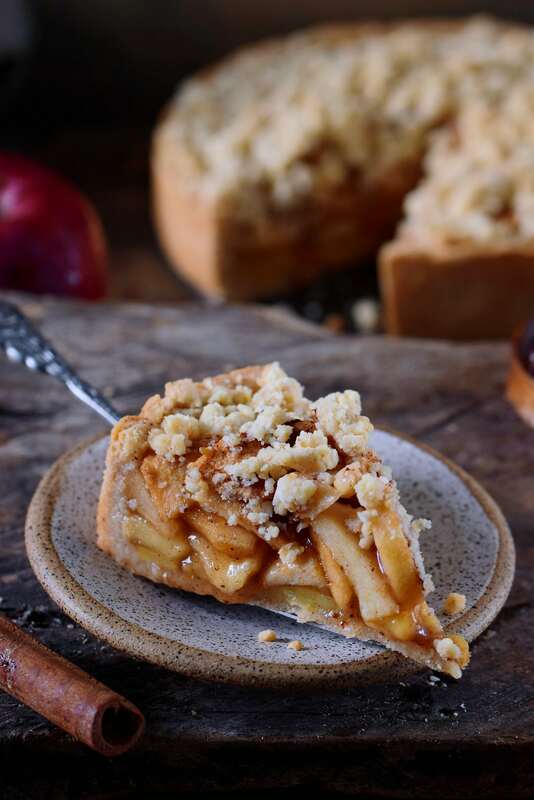 Enjoy this delicious vegan apple pie! You can use arrowroot flour instead of tapioca flour. One reader commented that it works perfectly to use 230 grams of 1 to 1 Bob’s Red Mill baking flour (gluten-free) plus 90 grams of almond flour. To make the recipe nut free, you can use ground shredded unsweetened coconut instead of almond flour. If you want to make the recipe grain-free you can experiment with using either buckwheat flour (instead of rice flour) or adding more almond flour. This will, however, change the consistency of the dough and you might need to add some water if the dough is too dry or adding more flour if it's too wet. OMG!!! This pie looks sooo good! Ps: i baked your Sweet Pea Brownie few times already, and it is for sure the best fudge vegan brownie i ever ate!!! And yay, I am so glad you liked my brownie recipe. This is such a delicious cake! ???? 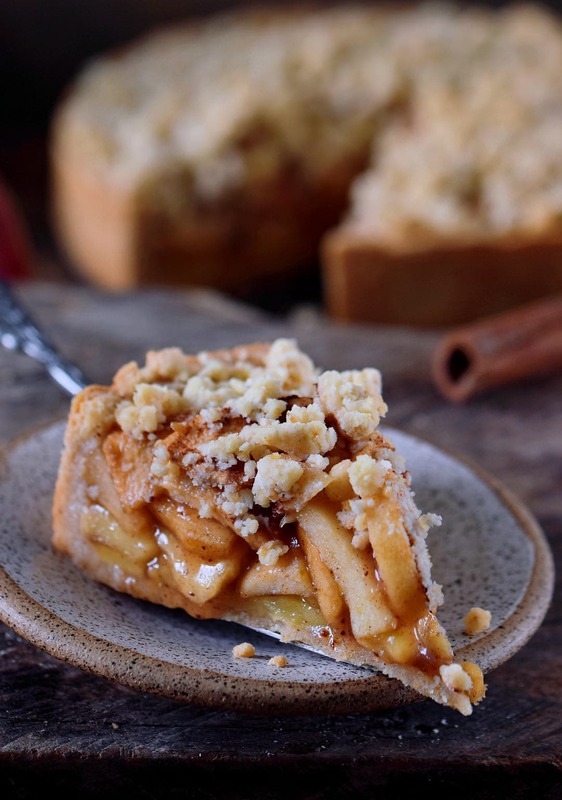 Apple pie is my favorite cake in fall and winter! Love it when served with whipped cream. Thank you, Bianca! Yes, apple pie is one of my favorites too. So yummy! Hello, can I use 1 to 1 Bob’s Red Mill baking flour? That mix has tapioca and rice flour. Thank you. And he much? 230grs? It worked! Perfectly! I used 230grs of 1 to 1 Bob’s Red Mill bakin flour (gluten free) plus 90 grs of Almonf flour of th same brand. Thank you for the recipe. I tagged you on my IG. I actually made small chocolate pies which this pastry recipe. I am planning on making this tomorrow. Can and should the pie be refrigerated if it’s not going to be eaten right away? What do you recommend? Thank you! Hi Ela! I’m going to make this for thanksgiving this year! Is there an alternative to vegan butter? Hi Katrina, you could try using coconut oil. Hope this helps! How do I make this nut free? Which items do I substitute? I’m planning to make this for my family for Thanksgiving, but I’m wondering if it will hold up in the fridge if I make it the night before. Or do you recommend making it the day of and eating it as fresh as possible? I loved it!!! Best apple pie ever 🙂 thanks for the recipe! !